Funerals and Memorial Services are for the living; they are, indeed, a celebration of someone's life. A Funeral or Memorial Service is an important step in helping the bereaved overcome their grief, and it gives family and friends the opportunity to honor a loved one and a chance to say goodbye. A Funeral is a service where a casket and the body of the deceased are present, and they are brought to a cemetery or a crematory following the ceremony. A Memorial Service is a service where a casket and the deceased are not present. 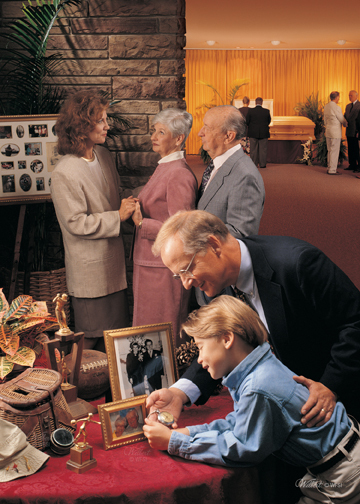 Instead, there may be photographs or other belongings of the deceased set out on display to provide a sense of the personality of the individuality. With a Memorial Service, burial or cremation may have already taken place, and the wishes of the family may be that they only want to remember the deceased as they were. A large formal public visitation is a common request but it is not always necessary or required. There may be a small gathering instead, which can be either public or private, with an open or closed casket. The Funeral can immediately follow this gathering or visitation, or can take place the next day. Funeral services are as unique as one's imagination allows. They can be simple, or elaborate, religious or secular. Music, readings, life stories and poetry can be added to personalize the event to both reflect on and celebrate the life that was lived. Funerals or Memorial Services can be held at your home, at our funeral home, at any church or at any cemetery; families today are becoming more creative with the types and locations of services they select. With over 100 years of experience in providing assistance with funeral services, we feel that we can offer more suggestions and guidance on how to make any funeral service selected more personalized and more meaningful.